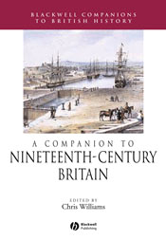 A Companion to Nineteenth-Century Britain presents essays by expert scholars on all the major aspects of the political, social, economic and cultural history of Britain during the late Georgian and Victorian eras. Truly British, rather than English, in scope. Pays attention to the experiences of women as well as of men.